Charles N. Bodey (1834-1904), was born of a prominent family, son of Benjamin (1799-1849), and Mary Magdalena Heffley Bodey (1800-1877), on September 16, 1834 in either Norwegian or Manheim, Schuylkill County, Pennsylvania. He lived his adult life in Orwigsburg, Schuylkill Haven, Pennsylvania. In 1855 he was awarded a diploma from the Pennsylvania State Agricultural Society for manufacturing a cushioned rocking chair. In 1857 he married to Nydia E. Bodey (1836-1914) and they had two children, Preston M. (1859-), and Grace E. (1862-). He served for the Union Army Company C-138th Pennsylvania Volunteers during the Civil War. Sometime prior to 1871 he was cured of a rupture by a famous traveling medicine man named Dr. Ferrard, heralded as the “Old Rocky Mountain Cancer King”. Ebenezer Locke Mason, Jr., went with William Fewsmith, and Warner to buy his coin collection in 1867 but Bodey refused to sell. Mason was thrown from the wagon as they were departing and was seriously injured. Five years later he sold his coin collection at auction through John W. Haseltine (5th sale) on October 29-30, 1872. In 1874, a notice ran in the Harrisburg Telegraph that he owned a silver Jewish shekel minted in 335 and worth 62 cents. He was a cabinet and piano maker by profession. A small notice published in the Pittsburg Commercial, Wednesday, March 15, 1876 reported that the editor of the Orwigsburg Times had seen a miniature piano made by Bodey out of walnut shells. In 1880, he was reported to own a Bible printed in 1755. Beginning in 1895 his business collateral describes him as an Undertaker and Dealer in Grandfather Clocks, and all kinds of Indian Relics. But, he also dealt in coins. He was an active client of the Chapman Brothers buying coins and curiosities. Fig. 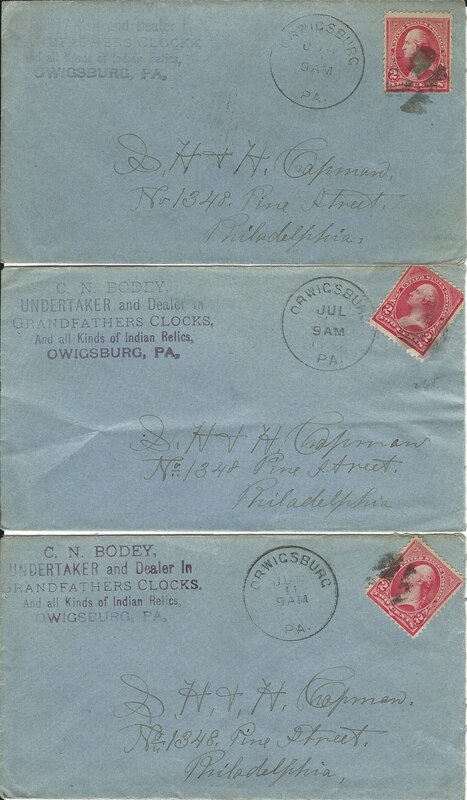 1. Letters sent by Bodey to the Chapman Brothers in June 1895. Bodey had a rubber stamp made as an Undertaker and dealer of all sorts. In 1888, Robert W. Mercer, the coin and curio dealer in Cincinnati, Ohio, accused him of selling fake Indian relics, particularly flint arrowheads. In the 1890’s he was the chief burgess of Orwigsburg and refused to sign the rules and regulations of the Board of Health. The town took him to court to force him to sign. Fig. 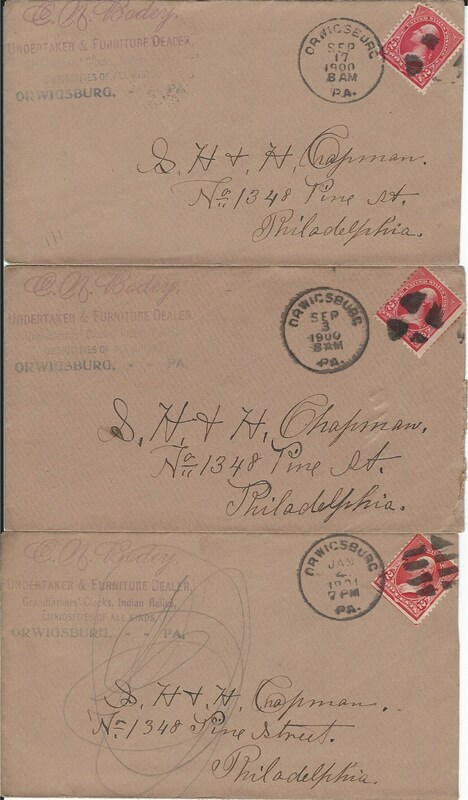 2. Letters sent by Bodey to the Chapman Brothers September 1900 and January 1901. Note the changed rubber stamp as an Undertaker & Furniture Dealer, Grandfathers' Clocks, Indian relics, Curiosities of all kinds. In 1902, he loaned the Grand Lodge of Pennsylvania an antique pewter dish purportedly owned by George Washington. He was murdered by his son Preston, a rural mail carrier, during an argument over his last will and testament dated October 8, 1904, in which he left his son only $5. His son hit him over the head with a coal bucket causing a fatal wound and blood poisoning on December 30, 1904. The son was acquitted after a three-day trial by the testimony of his mother, who attested that his father struck him first with a shovel. His daughter Grace was left the entire collection of coins and curiosities. Fig. 3. William G. Clifford's (1863-1907) postal card to the Chapman Brothers, postmarked January 21, 1905. 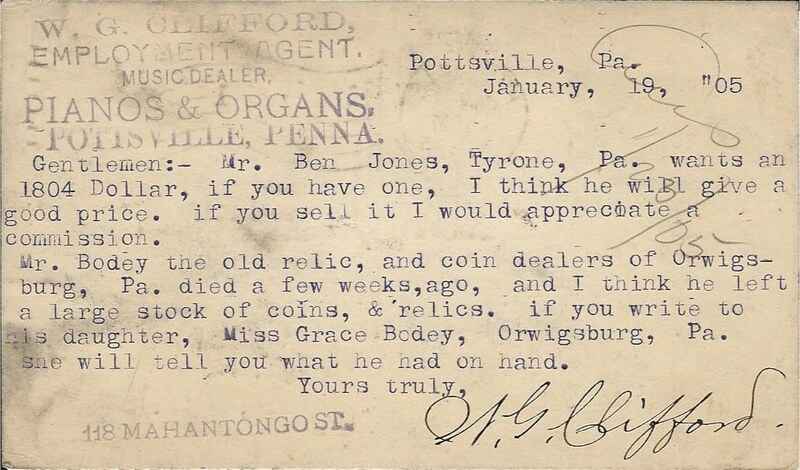 "Gentlemen : Mr. Ben Jones, Tyrone, Pa. wants an 1804 Dollar, if you have one, I think he will give a good price. If you sell it I would appreciate a commission. Mr. Bodey the old relic, and coin dealer of Orwigsburg, Pa. died a few weeks ago, and I think he left a large stock of coins, & relics. If you write to his daughter, Miss Grace Bodey, Orwigsburg, Pa. she will tell you what he had on hand. Yours truly, W. G. Clifford." Inscribed in pencil by the Chapmans "Ans[wer] 1/23/05". Courtesy the Lupia Numismatic Library, Special Collection, The Chapman Family Archive. He is buried in the Reformed Lutheran cemetery of Saint John's United Church of Christ Orwigsburg, Pennsylvania. His tombstone has a Masonic emblem on the top stone. Bodey, C. N. Catalogue of a collection of gold, silver and copper coins...catalogue by John W. Haseltine [Auction sale, Oct. 29 and 30, 1872., Philadelphia, 1872. 29 p.
Adams, American Numismatic Literature Vol. 1, 49.